does anyone have any spells to keep the law away from you. Can anyone help me with this problem? How can I stop unwanted people coming to my house and knocking my door and dropping legal papers through my letter box? sorry I should have explain myself more -- this is not a neighbour, this is a council forcing me to register on the electoral rolls. if I don't register, they said I will be fined a £10000. I do not see why I should register when I don't want to vote. No council can make you vote Jacqui--your vote is your business. I would take all the letters and pamphlets that they are dropping off and send them back to the return address dressed with hot foot powder. You should also call you local city council and tell them that you are being harassed and if you don't get a response there, then go to your local newspaper and tell them about the situation. That is intimidating voters and its illegal. Magically, hot footing would be appropriate for this case, as would a freezer spell to get them to STOP. Some countries actually do require you to vote or pay a fine. However this isn't the case with all countries, just some. Find out what the laws are in your nation and if these people have no legal standing then dust those pamphlets and send away. I would also sprinkle a mix of Salt, Black Pepper, and Barberry along your walkway while praying that they are unable to even approach your house. Good point ConjureMan Ali--I was assuming that Jacqui is in the US when I wrote the above post. Jacqui if you are not in the US and there are laws forcing you to vote then I would continue to hot foot and also use Law Keep Away products to protect myself and my family from retribution/punishment. We should all remember that this forum includes people from all over the world. It would be helpful if posters would adjust their settings to indicate their gender and region. What can I do if someone has a Warrant in a larqe amount, and what type of work would I need to do on him, if he does not even live with me, and he wants the law to not arrest him....I don't know what candle work to do, or what would help me? Freezer Spell? Protection Spell? From the law? The person I'm talkinq about comes home in 2 weeks and he does not need to qo to Jail, what could I do? And of course pray over the items, and double dress with the oils and the powder as it resembles him, you know? He needs to turn himself in and take care of that warrant whether that is going to the courthouse, and scheduling a trial date. He needs to exercise that common sense, and not run from the law. I would have him go to the courthouse, and then you can do a court case spell work and some law keep away to prevent him from getting arrested. You can do a sweet jar on the judge, and simply state "judge handing (target's) case. So that he will not go to jail. Depending on the warrant, and his priors they probably will give him a chance to pay that fine, or do community service. In addition, when he goes in I would give him a court case mojo bag dressed with some law keep away. I know that worked like a charm for a friend of mind. Yes you can do what you listed above, HOWEVER, chances are he is not going to be able to run forever. So I would do the law keep away so that when he does get a court date that he does not go to jail. I would accompany that with a court case candle so that he wins the case. Okay! Stars your the f---ing BEST!!!! Where can I qet a COURT CASE CANDLE? And if he is thinking about continuing to not take care of his warrant then you need to do some king solomon wisdom to help him make the right decision. Don't qet me wronq, he and I both want him to pay this off. We dont want him qoinq to jail, he just wants them to be patient so he can qet a job first. And setup a payment plan....all he wants is to not qo to jail. Trust me, he just wants to find a job and pay them off as quickly as possible. If they run a background check and find out he has warrants he may not get hired. But you can get a reading and see what would be the best action to take. He needs to go to court, like Starsinthesky said. Once he's there he can petition to work out payment plans, set up a court date to deal with it later, but he can't simply let the warrant hang over his head. K. So I qot my readinq and my rootworker told me exactly what I need to do. What day do I perform "COURT OR LAW ENFORCEMENT" work? You can perform it Sunday, Tuesday, and/or Wednesday can be appropriate. I listed Tuesday because its for victory and power. Thanks hunnie bunches of oats...now would you possibly know which PSALMS is appropriate for me to use on him and the work i'm qoinq to be doinq? And please read the court case info page which has an extensive list of prayers you can say. I will...I just didnt know which one to use in his condition...lol Thanks Mucho! I was hauled in to the police station yesterday (ok, well they said it was a 'voluntary' interview, but I had to attend) after my ex partner from last year has made allegations towards me. He put me in the firing line as didn't know anyone else who could have done it. Apparently I am supposed to have sent a really foul package to him with a very threatening menacing letter with threats to hurt his family, a threatening text towards him, made a fake profile on a website etc. I was interrogated but answered all of the questions without a lawyer present; the officers said I didn't "require" a lawyer now because I was merely giving a witness statement, yet nonetheless I felt like a criminal. The questions asked were awful, like have I ever paid someone to send him this that and the other. I burst into tears at one point when they read out the sick text, the officer kept smiling at me and telling me I wasn't a "suspect", I was a witness, but as reiterated, I felt I had done wrong. The original officer dealing with my ex said he got my number from a database because I had made a police complaint the year before and they kept it on record. Now I'm worried my ex is going to want justice still, despite the fact I told the officer that although I was annoyed initially at his cowardly way of ending it by text, they will demand to start searching my house, IP address, you name it to find these so called "websites". I stupidly browsed them yesterday after wondering what on earth they were talking about. I want my ex to stop thinking it was me, for the police to not contact me ever again regarding this matter and for the case to be dropped (against me). Although my friends and family said according the the officer dealing with my ex's email to me, stating they should have no reason to contact me again, I really want that to be it!!! I am going to buy the 8" vigil candles. 1) I was thinking of the Court Case one or Protection. Which one would be best? 2) Is there a spell to incorporate this? 3) I have also purchased a LM mojo protection bag. My apologies if I have rambled or gone off track, I have tried to keep this in the right area. I am sorry to hear you have been put through so much trouble. Someone certainly dislikes your ex! 1) You are over-reacting. This is not a court matter, it is a police matter. Hence you should purchase one of our Law Keep Away candles. 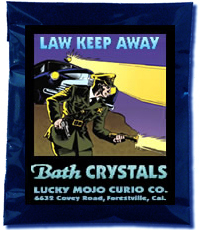 You can also prepare a simple door scrub with Law Keep Away Bath Crystals. 3) A protection mojo will help. I am looking for saints or novens known to protect agaisnt law enforcement and IRS, I've been praying to st. micheal and I nailed the pennies in the house what else can keep the law away? Keep a glass of very, very sweet water behind your front door. Every morning, take a little bit in your hand and sprinkle it outside your door three times, saying, "In the name of the Father, Son, and Holy Ghost, let the policeman walk on, let the policeman walk on, keep the policeman moving on." Stillsosola, Law Keep Away supplies are made precisely for needs like yours. I don't know what context you're trying to keep the law and immigration away with, but Santa Muerte and Jesus Malverde are both sometimes petitionned - usually in conjunction with staying hid when performing illegal activities. Use the Crown of Success and the Steady Work powders on your application and dust yourself with them too. This can help to have any past infractions overlooked even if they do see them. Include that in your prayer as you use the products. On the day they finger print you if you can have just a small amount of the Law Keep Away oil on your hands it will help. Try to shake hands with the person taking your fingerprints if you can. You can also of course put the products on candles. Take one candle and anoint it with crown of success and Steady Work with a petition paper under it stating that you will be successful and get this job. Take three other candles and anoint them with your law keep away. Arrange them in a triangle around your success candle to guard against the criminal record causing you to not get the job. You can put petition papers under those candles to asking that the law not keep you from your job. Ways I'm planning on keeping the law away is with a Law Keep Away oil lamp with law keep away-type herbs in it along with an Indian head penny and the Law Keep Away Oil. I also plan to put 9 Indian head pennies above my door when I can afford them. I also have an Indian head penny I'm wearing as an amulet that I anoint weekly (I got that idea from a post on this forum and I really liked it). I also have a question about a specific way to keep the law away: I seen on the tansy page on Herb-Magic.com that it says you can put tansy in your shoes to keep them away, but how often do you change the herb in the shoes and put the new tansy in? Every week? Month? I can't find info on that. I'm going to try that, maybe with Law Keep Away Sachet Powder as well. It sounds like you have some great ideas for work! As for your tansy question, I'd put a new pinch in every week, or if that seems too often, every couple weeks. Stepping in an out of your shoes will gradually deplete the tansy (it will stick on your socks and get pulled out, that sort of thing), so you could also just replenish it if it looks like it's all fallen out. I run a small business which we always submit audited report to tax office (FIRS) for company income ax returns and pay all necessary education and income tax. the issue now is this: all the companies we work with deduct VAT & WHT( value added tax and withholding tax) on source before they pay us that it belongs to government which they usually pay. Now after our audit report submission, FIRS keeps asking us to re-pay the VAT that the companies are not supposed to deduct from us claiming it is our duty to pay it making it double taxing to us. Note that the WHT paid by my client belongs to us as it is part of our company money. Now we want to do another audit for this year and i don't want them coming to my office or making any arrest again. we are yet to submit the report to them and once we do they will start harrasing/arresting us again and i am tired of this. Note: the WHT amount with them covers all amount for VAT they are asking but they refused. Thanks all as i await your replies. Miss Aida, thanks it is LM products I am asking of and not other company. I have bought some from them just last month. I believe you did read through my write up. So what are your advice's to me. Did you read through the page that Miss Aida linked in her reply? There is a lot of good information and spellwork there. I am in need of a good way to protect my car from being repossessed until I can pay it off. I was in a house with a garage until 2 months ago now I have no way to hide my van until I can pay them off. The good thing right now is they dont know I have moved YET. I really need to keep the van in order to go to work. It will probably be about 4 months until i can pay but I was thinking of dressing the money orders I send in some type of powder and burning a skull or some type of candle. I am not sure how to use the loan company's name on the letters they've sent and whether to use fiery wall of protection products or confusion? Any help is greatly appreciated!! "Get the oil on your finger and draw eyes on the car so it is on the look out for cops and repo man. Dress a petition paper with the oil and hide it in the car. Mix the oil into some water and wash your car, essentially giving it a bath." I'd also recommend using agar agar (it's a powdered seaweed product used as a thickener) to sprinkle a line around you car, rendering it "invisible," or at least less noticeable. That trick can be found in Cat Yronwode's "Hoodoo Herb and Root Magic" book. And lastly, keep paying those payments, and don't be late! You could lightly dress the money orders with Law Keep Away powder to get them to take your money and leave you alone. Thank you so much sisterjean, I apologize about posting the wrong place, I don't post that often!! I will give that a try! I'm placing a new LM order and wanted to ask for help before placing it to make sure I get the right stuff. I know I'll need Law Keep Away products, not sure if I'll need anything else though and also I'd appreciate advice on how to work it. I have epilepsy, which is kept under control with medication. I also have migraines though and medication doesn't help much (or, if it does, the side effects aren't worth it). I'm going to start on a small dose of daily CBD oil soon to help with migraines. If it works, eventually I might get off epilepsy meds and just use CBD, but that's further down the road. So, I'm looking to prevent my current job ever drug testing me. I don't do drugs so they don't really have a reason to, but I'd rather not chance it in case they ever decide to do random drug tests or something. I don't want to suffer bad quality of life just because our current laws regarding what is essentially medicine are so stupid. Anyway, so I'll be doing a Law Keep Away working, but it'll be something I want to keep going long term. Any ideas? Anything else I should use besides Law Keep Away, something for invisibility or something? I work with saints but don't work with Santisima Muerte or any other drug saint. 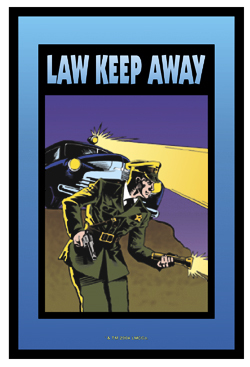 ETA: Now that I think about it, maybe Law Keep Away isn't the right way to go? I'm not smoking pot, so I won't be arrested. CBD oil is legal. I just don't want to be drug tested. I'll lose a professional license. Law keep Away is good. Also, make sure that you have ongoing protection, too! Ah, that's great info! Thanks, cleared it up for me, wasn't quite sure the best way to work it. Ok now I know which products to add to my order! I'm planning on doing the Indian Head Coin & Railroad Spike spell to keep the law away. It says to use the graveyard dirt of a deceased policeman. It also said to be careful when using the dirt of murder victims because they could be vengeful toward anyone for religion, class, race, age, etc. The deceased policeman I plan on buying graveyard dirt from was shot and killed in the line of duty. Most deceased policemen are. So I'm not sure if I should use his or dirt from a soldiers grave. Any Advice? If you're worried about it, I'd recommend just trying to find a policeman who died of natural causes or doing something heroic. Not all of them are shot and killed in the line of duty. Can anyone give me advice on this topic? My boyfriend was deported from the US to Germany. He found a way back and currently lives here as he has since the age of four(he's 50). He is a convicted felon, due to dumb decisions at 17 and has one simple possession charge.. This is the grounds on which deportation happened. Now that he is back if found he could be sentenced to 20 years in prison for illegally re-entering the country. He's a home owner, pays taxes, isn't a criminal despite a few bad choices, and has had his life ripped away from him. Now he is back there is basically nothing we can do legally to help him other than a plea for mercy to Homeland defense. I would love a spell for that and a spell to keep all cops away from him while driving. Also a spell for the DMV. His DL is expired there for if pulled over the cop will investigate further than a ticket. A friend said there wasn't any sign of his immigration status on the DMV system but another way of confirming or obtaining information like that would be helpful. He basically needs a new Identity. Yes, a spell for new ID documents and to be invisible to all police. I am sorry to hear of your boyfriend's situation. You are in the right thread, as there is great advice in the posts above yours. Please read them for ideas. You should be working with Law Keep Away products, to keep him free of any law enforcement investigations. Please, please, please let this be the right forum! Hello-I am looking for help in casting law stay away spell. I own a business that relies on Medicaid/Medicare funding. We are being investigated (they have not stated nature/reason of investigation) by our MCO (assigned agency who manages Medicaid dollars and oversight of providers in our area). They have asked for documentation for several members....we have mostly all of documents, but are missing a few things here and there. These actions were caused by a disgruntled former employee who was stealing from company (supplies and time), lying, having his women come to job (he’s married) and finally falsified his credentials. Before he left, he knew I was on to him and kept mentioning how he wouldn’t be here by the 1st of the year. He refused to pick up his final paycheck from attorney, has tried to call Labor Board (didn’t work, as attorney verified check had been there since his final pay period). I know he messed with the documents because we had an audit in October and they were there, but are gone now. In any case, I want the MCO to leave me alone, find in my favor as much as possible and close this investigation case. I want to do the law stay away. Is this the appropriate spell? I have the kit. I would do everything at home, but bring the powder to my business and sprinkle in my personal office and room investigator will meet in. Is that the most appropriate action, in this case? Can I nail the pennies to my door at home or do they have to be nailed at business, since spell is referent to business? Honestly, at the business would be difficult, unless I did interior door of my office as it would be hard to nail to front door as you walk in (building is brick), other side of front door would be very obvious. 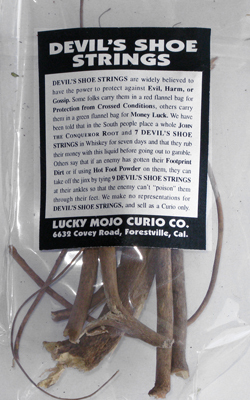 Can I hang a law stay away mojo bag in an inconspicuous place in office/business? I have 2 (I purchased one and one came in spell kit), so I would wear one. I have, also, put former employee, investigator in freezer. I am sorry to hear you are going through all of this. What a mess. You have good ideas in place so proceed with your spell kit. Sprinkle the powder at work, as well as nail the pennies there wherever you can. Keep your second mojo on the premises, but out of sight of anyone. Make sure you feed it weekly with either the oil or whiskey. And your freezer spell for the cheating employee and investigator is great. Thank you so VERY much, Miss Athena! I just sent order to run vigil candles. I will definitely keep everyone posted.